Angus Trim 1561 was a longsword of European style inspired by the original swords from 15th Century. The sword's size fit me perfectly. The length of the hilt was 3 hand-span for me while the overall length reaches my solar plexus. The only thing I would like to have is a crossguard as long as the hilt, as suggested in Guy Windsor's book Swordsman Companion. The seam on the hilt was fine and the grip fit my hands very well. I did not have to wear gloves in handling this sword. These were the major reasons I purchased the sword right away. The sword was quick and light, just like my spadona. In fact, they handled very similarly. Where the spadona was heavier overall with a closer-to-hilt balance, the AT1561 had a lighter overall weight but a stronger blade presence. It did not take any time for me to adapt the AT1561, at least that was what I thought until the first test cut session. The sword followed the point very well in thrusting. It was also easy to accelerate and stop in cutting motion. Combined with its fine edge geometry, lightweight and relatively high flexibility, even the narrow blade did offer option in half-swording, though, one could not argue that this was a sword designed for unarmored combat. 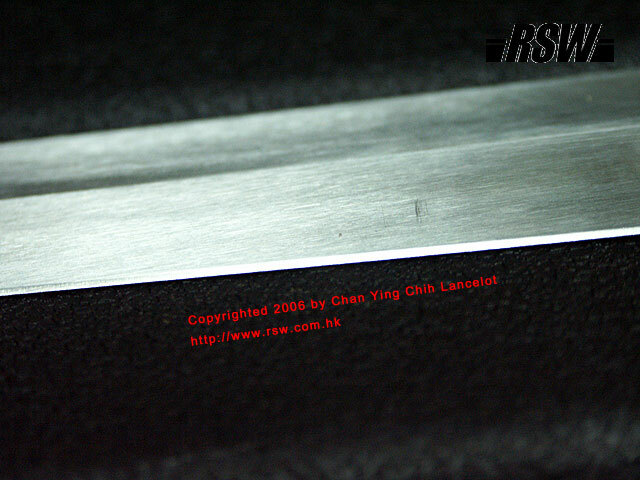 The stock-edge with this sword had a fine geometry and the edge lines had almost no dull spots below the forte. In fact, the other two swords that I ordered with fine edges had more dull spots than the review sword. It could be that in the process of producing the finer edge geometry, the edge lines were not taken care of to the same degree. Nevertheless, I was impressed by the edges geometry of all the three swords I received. They were now on par with the tinker sword's edges I used to have and without doubt, a significant improvement over the old Angus Trim swords I had handled. The edge lines were undulating but would not affect the functionality. Also, it did not stray away from the utilitarian style. 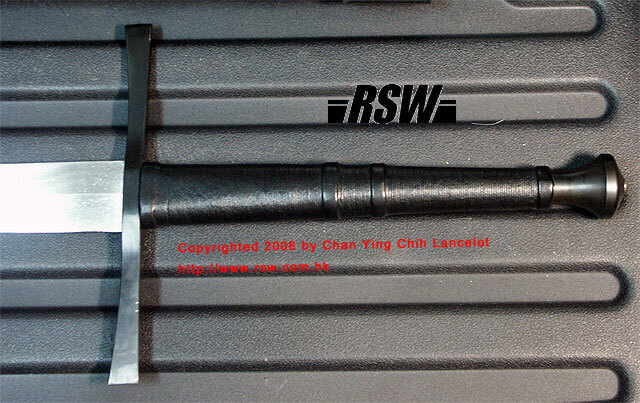 I also like the blackened hilt components so I would be less worrying about stain and rust. I performed two test cutting sessions with the stock-edge on water bottles with this sword. I did not video tape the first sessions but I can honestly tell you that it made me embarrassed in front of my friends. Having cut a lot with the spadona had made me over-confident. To my surprise, my first cut shot the bottle down the street in one piece. Damn. I soon realized that I had to readjust my grip since the grip of this sword was bulkier than the grip of the spadona. Once I had done that, I had no problem in blade alignment and could do an honest evaluation, thus I video taped the second test cutting session. In the second test cutting session, I learned another lesson. While I could produce very accurate and fancy, short ranged cuts with the spadona, this sword required a significant different aim, perhaps due to the more uniform distal tapering, or the increased length, or both. 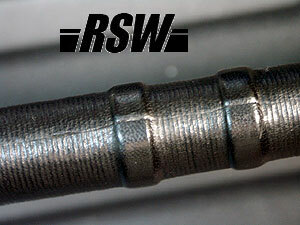 The slight difference in the grip magnified to an inch of difference at the tip. That was how I ended up hitting the wooden pole twice, embarrassing myself in front of the audiences again. The sword edge showed only one dot of light after the accidents, though. Tough it was! At the end, some cuts were smoother than the others. The smooth downward cuts' feeling was comparable to my spadona's cuts and a lot better than most swords I had handled in this price range. All the upward cuts penetrated the bottles slightly only. Tip cuts worked better with the soft targets than COP cuts because the latter produced more shock and resistance, which was observable by the distance the bottles flew away. This also showed that the sword performed a lot better in tip cutting than the old Gus Trim swords years ago. Nevertheless, I experienced no vibrations in my hands. One could say the sword was not as forgiving as some with the wider blade but to me it cut sufficiently well, even before I touched up the edges. Since there were dull spots on the edges, I tried to avoid evaluating the edge holding ability of the sword after cutting the water bottles. After all, it would be very difficult to differentiate which dull spots were caused in the cutting and which were original. However, I would evaluate this after I touched up the edges to clean up all dull spots. After cleaning up the dull spots on both edges, I proceeded to test cut again on water bottles and video taped the result. I found that the performance was not improved much over the last test cutting, showing that the in-stock edge lines were more or less pristine after all and the occasional dull spots did not have much effects on the cuts. Against harder bottles like the coca cola ones, the cuts sometimes just bounced the bottle off. Yet, most of the downward cuts were successful, and I managed to pull off one false edge downward cut successfully on a soft bottle. On the same day we had test cut with the spadona and the atrim1572 long saber with fine edge. It was obvious that the at1561 with the in stock edge was having more difficulty in dealing with the soft target compare to the two swords, yet also suffered less dulling in the test cutting. In fact, it was almost unnoticeable with bare eyes. It would seem that the AT1561 would fare better than both the swords in edge retention against harder target like pork arm. First I would like to make it clear that the pork arm was tougher than the human arm of the equivalent size, be it dead or alive. The skin was thicker, more difficult to slice through. The fat was more and the bone was sturdier. Even the fingers and nails were much tougher than the human's. Plus, in the test cutting session the pork arm was hung by a string, giving a lot of room to give away from the impact force. So if the pork arm was stuck to a body weighting over 150 lbs, the cut would go much deeper. As a conclusion, all the results demonstrated in the test should be magnified to a certain degree if it was performed in an actual combat where a human body was hit in a similar way. According to my pork arm cutting experience, taking into account that the design of AT1561 was a light, fast cut and thrust long sword for unarmored combat, it had performed very well as one can see in the video. All the COP cuts went very deep and later on, after the majority of the target's mass was removed, the tip cuts still penetrated deeply into the bone. So if it was a human target with the body mass backing up, I had no doubt that the sword's COP cuts would remove a limb where the tip cuts would be disabling. After the test cutting, I brought the sword back to my special lighting room where I could view the edges very carefully and detect any slight dullness. 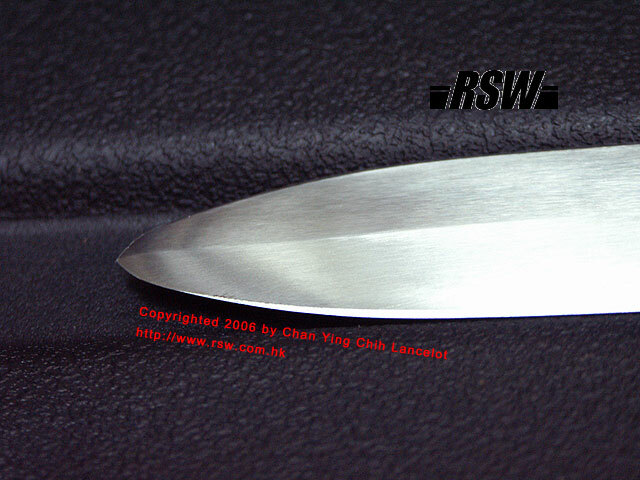 The sword performed very well on the edge retention aspect where there was no noticeable dulling. The edges stood well against this demanding test! While the sword had a relatively high flexibility, gripping it with two hands and tapping the flat side against a mobile chair showed that it was still reliable to parry with the flat. Unless the stress happened on the tip portion, where a parry should not be made after all, the blade did not seem to be flexing far enough to make me worry. In fact, when tapping the middle portion to the forte of the sword against the chair, the chair was simply moved around without the blade vibrating much. 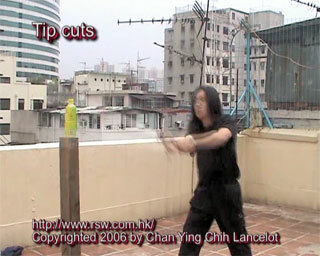 Tapping the middle part of the blade or forte against an immobile target with moderate force showed a stiff response. It was observable that the flex was a bit more than the spadona in the middle of the blade to the forte, as the distal taper was more uniform than the spadona. However, there was a huge price difference between the two swords as well. So I would say the design of the sword worked well in both offense and defense. 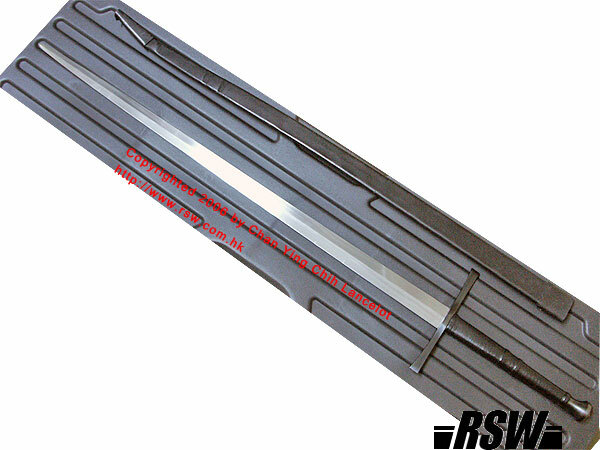 Blade width at base: 1.625"
Blade width at tip: 0.5"
AT1561 featured several improvements over its predecessors. First of all, the grip was leather wrapped with cord beneath, providing more gripping power than the wooden surface of the old Atrim's grip. Secondly, the hilt's shape tapered less so that it fit both of my hands better, while still allowing me to change my grip easily during action. 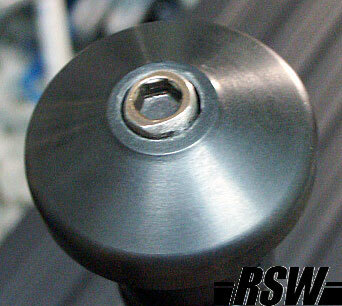 Thirdly, the components were blackened and became rust resistant, fitting its utilitarian design. Fourthly, the edges were much finer than its predecessors with the geometry comparable to Tinker's level, even if the edge lines could have some dulled spots (very few in this review's sword case). Moreover, even though Gus paid a lot attention to COP cutting in the past, the tip cutting ability was not ignored in this sword. With such a narrowed tip, I did not expect it cut that well. In addition, I used to doubt Gus' approach in balancing a sword further out, like 5 inches or more down the guard, but with a lighter overall weight. After testing this sword, I had no more doubt in this design's functionality. The edge retention ability was impressive too. While not among the almost magical retention that I had seen on Martial Art Sword Sun Flower Classic, it was performing very well in its price range, perhaps the best. The edge geometry was a design to handle both water bottles and pork arm cutting and it did the job perfectly. It would not win the soft target cutting contest against the finer edged swords, but it would cut the hard target very deeply without suffering visible damage. In my opinion, for the price of the sword it had proved itself worthy for every dollar as a utilitarian sword for WMA practitioner that would last long enough through repetitive cutting practices.